Achi Chokyi Drolma is the main figure in this thangka. This thangka tells a story. Our friend, Chetsang Rinpoche had a dream while I was pregnant that Achi Drolma was bringing a baby. He dreamt that the baby slid down on a tree branch to take birth. He said the dream was about the birth of our daughter, Tara. 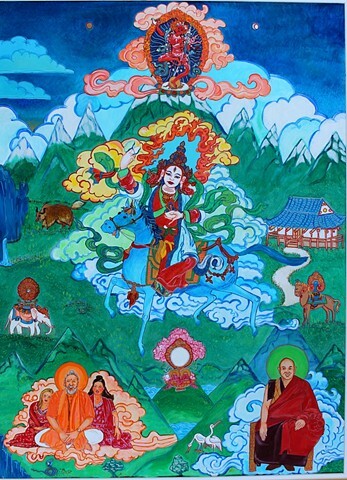 Achi Chokyi Drolma is the Grandmother, protectress of the Drikung Kagyu school of Buddhism. She rides a blue horse and holds a damaru drum in her right hand and a skull cup with wish-fulfilling jewels in her left hand. VajraYogini dances in the sky above her. The setting for the painting is Shoshoni Yoga Retreat and the Shoshoni temple is on the right. My husband, daughter and I are in the lower left hand corner. The cobra is for my husband and represents Kundalini Shakti. The elephant is for me, I grew up in a zoo with 8 brothers and sisters, and my dad was the curator. Babe, the elephant was our friend. The wild yak refers to the Tibetan name given to me by Rinpoche, Yeshe Kadro, a Dakini who rides a wild yak. The pony is for my daughter. The cranes are for Rinpoche who sits in the lower right corner. Cranes are painted for long life. I call this our family thangka and it reminds me of happy days and happy family. It took me 14 years to finish painting. Our daughter turned 20 the year I finished.